Before the rise of digital photography in the 2000s, photofinishing was a big business in Hong Kong. The first photofinishing chain in HK was not Fotomax (which was founded in 1982) but the curiously named Stereo Ltd, which started its life as a camera store in 1954 and was the leading photofinishing chain in the 1960s and 1970s. The Chinese name of Stereo stands for “natural” and due to its popularity, the firm’s Chinese name”天然冲晒” (which could translate to “natural photofinishing”) became a term and was used as the name of a song by Cantopop singer Denise Ho. In the post War era, cameras and photography became mainstream (in part thanks to affordable cameras such as the Halina by W. Haking and Holga by Universal). It was with this background that a UK-educated entrepreneur by the name ofC.C.Yue (余金佳, 1925-1965) foundedStereo Camera Equipment Co (天然攝影) at 40 Des Voeux Road Central in August 1954. CC Yue was the second son of Yue Kee-wan (余基溫, 1898-1978), a Fukienese businessman who made his fortune in Southeast Asia. In the 1950s, Yue Kee-wan shifted his focus to Hong Kong where he became an important player in the hotel and real estate business through companies such as Yee-Tak Investment (義德企業, incorporated in 1962 and dissolved in 1995) which CC was the managing director of. In 1957, Yue Kee-wan joined a group of businessmen led by jeweler Young Chi-wan (see article on Pro-Quality Electronics) in acquiring the Miramar Hotel on Nathan Road from the Spanish Catholic Mission.Outside of Stereo, CC also served as director and deputy manager of Miramar and the Yue family’s association with Miramar lasted for over half a century. When the hotel was re-developed in the 1980s, one of the buildings was named Kee Wan Tower in Yue Kee-wan’s honor. CC’s eldest brother Woo Kim-phoe (余金波, 1919-2009) was vice chairman of Miramar from 1985 until his death in 2009 in addition to being chairman of Tectona and Tong Seng Enterprises while his third brother Robert Yue King-cheong (余金城) was director of Miramar from 1966-2002 in addition to being founder of Mayfield Securities (which he sold to Luxembourg interests; he stepped in as acting chairman of the Stock Exchange of HK in 1988 after Ronald Li was ousted)and director of King Fook from 1987 to 2000. The first Stereo shop opened at 40 Des Voeux Road (now Tung Ming Building) started out only selling camera and stereo equipment (which explain the name). At the time, most families in HK did not own their own cameras and for taking pictures, they would go to studios for portrait sittings which would also process the pictures for them. The introduction of cheap cameras from Japan such as Minolta (see David Miao article) changed that dynamic and Stereo stepped in to meet the demand for photofinishing service from the new camera owners. 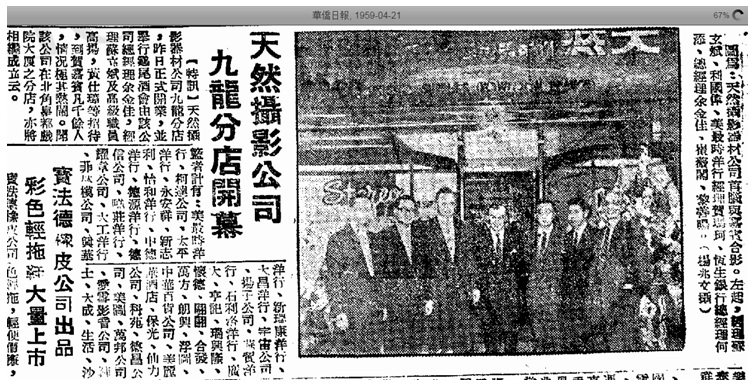 In 1959, Stereo opened its Kowloon branch at the Yue family’s Miramar Hotel. Another branch was soon added at the State Theatre in North Point and the business which started as a hobby quickly became a real business. In 1962, CC Yue and his wife embarked on a world tour which included a stop at the head office of Eastman Kodak in Rochester, New York in August, touring production facilities and checking out state of the art photo processing equipment. Yue was particularly interested in the Charlie Brown camera handbook commissioned by Kodak which launched its Chinese edition that October. 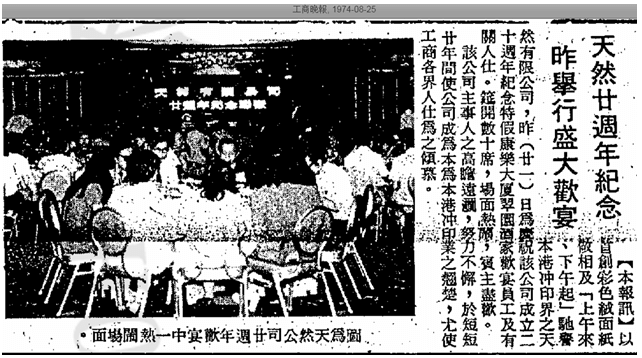 The same year, Kin Kiu Enterprise (建僑企業) which was chaired by Yue Kee-wan and countedCC Yue, Young Chi-wan and his son Albert, Stanley Ho, Cheng Yu-tung and his brother Cheng Yu-pui of Chow Tai Fook, Lo Ka-chung of Foo Heng Jewelryas directors acquired the site of 38-48 Queen’s Road Central and developed it into Manning House (萬年大廈). 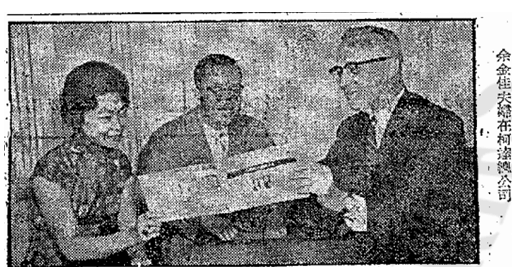 In January 1965,Yue Kee-wan as chairman of Kin Kiu unveiled the foundation plaque of the Eric Cumine designed Manning House (the original plaque which contained all the names of Kin Kiu’s directors including CC Yue has since been removed). Sadly, less than three months later on April 1, the overworked C.C. 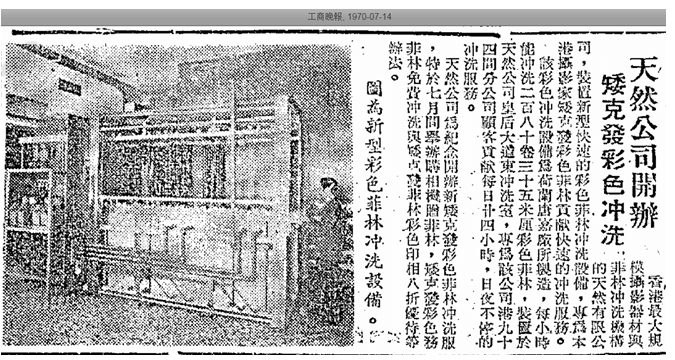 Yue died at the age of 40 and his widow Wong Yuk-yu (王玉如Mrs. CC Yue) succeeded him as chairman of Stereo while his lieutenant Robin So (蘇立斌) as managing director ran the day to day operations. Stereo maintained its head office at Manning House until at least the 1980s. Under the leadership of Mrs. Yue and So, business continued to grow. 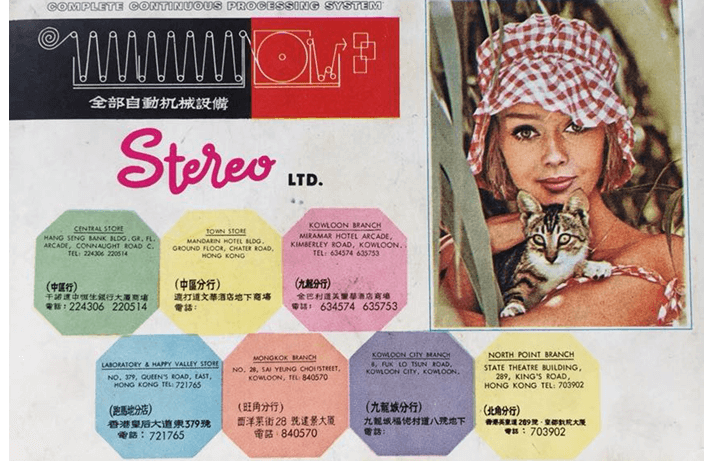 By 1969 when Stereo celebrated its 15th anniversary, the firm had 12 outlets in HK and Kowloon. To celebrate, the firm hosted a special photo exhibition at the 8th floor of the City Hall featuring photographs by leading HK photographers from 1954 to 1969. The next year, Stereo acquired new Agfa color photo processing equipment from Holland which could process 280 rolls of 33mm color films per hour, 24 hours per day at its Queen’s Road East finishing lab. This enabled the firm to deliver same day service (a first in HK) and as a chain, it also offered customers the option of dropping photo off at one branch and picking it up at another. Front and back of Stereo photo album in the 1970s. 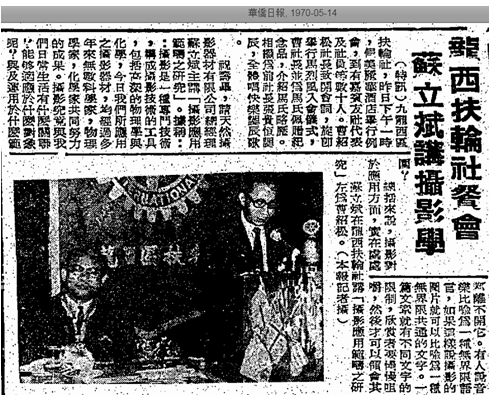 In 1972, Robin So was elected chairman of the industry trade group HK & Kowloon Photographic Merchants Association (港九攝影器材商會, now HK Photo Marketing Association). In the 1970s, Stereo had over 14 branches in HK and Kowloon as shown above – including 6 in the HK side – 3 in Central (Mandarin Hotel, Hang Seng Bank Building, Yat Cheung Building at 28 Des Voeux Road, now Bangkok Bank Building) and one each in Causeway Bay, North Point, Happy Valley and 8 in the Kowloon side: Miramar Hotel, Mongkok, Kowloon City, Kwun Tong, Argyle Street, HK Hotel, Yaumatei and Royal Theatre. By the late 1970s and early 1980s, competition in the HK photofinishing industry intensified with major competitors such as Broadway Color Lab(百老滙, subsidiary of Broadway electronics chain), Asia Photo Supply (愛雪影音), Hongkong Photofinishing (香港冲晒, formed in 1972, dissolved in 2003)and Fotomax. 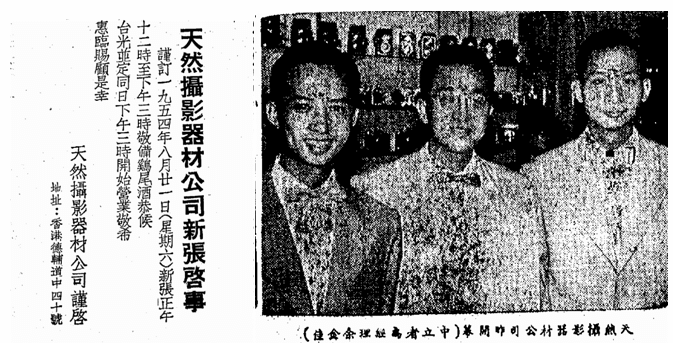 In 1988, the Yu family decided to sell Stereo to Ho Yin-man (賀賢敏). According to court documents, as at 31 March,2003, Stereo had assets with a book value of about HK$87 million and total liabilities of about HK$98 million and became insolvent in July 2003. As a firm, Stereo Ltd was incorporated in 1963 and dissolved in 2012. In 2004, Vevion HK Ltd (威運香港有限公司) which was controlled by Climax International executive director Chan Hoi-lam (陳海林) took over the business of Stereo, keeping its Chinese name 天然 and its iconic Chinese font logo but changed its English name to SKYphoto. Today, SKYphoto is still in business but no longer maintains its own retail outlets. This article was first posted on 23rd April 2018.